15% Savings and plus we only charge for shipping one item not 2! This holster and mag carrier combination is a definite upgrade. 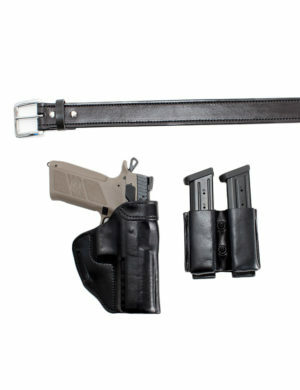 This upgrade includes a (B-1B) Slim Line Deluxe Pancake Belt Slide Holster with Thumb Break as well as a Single Mag Carrier, both with full tiger shark and elpehant covering the entire front. We’re bundling this setup to not only save you money, but due to the fact that the texture and shade of each hide can vary, and may not match if ordered separately. 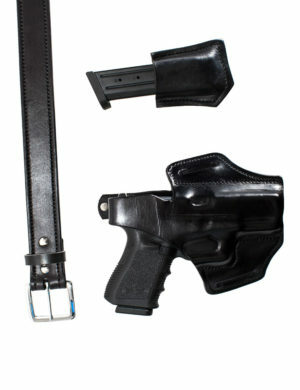 This setup offers a very professional look and feel while carrying your firearm. Tiger shark and elephant is one of my personal favorite leathers to use not only because of the look but also the durability. These exotics will not only last the test of time, but look great while doing so. These bundled holster and mag carriers are perfect for anyone wanting something out of the ordinary and prefer a rig that will last a lifetime. Try one of our exotic bundles today while the hides last.